I’ve been out fabric shopping with friends; trying to establish a regularly meeting needlework circle at a local mall on Fridays; battling the Sacred Dust of India as it tries to repossess the flat; writing a presentation and workshop on the style intersection between Kasuthi embroidery and Renaissance counted work; dealing with assorted technology annoyances; working on TNCM2; trying to parse out more interesting blog entries from my London pix; and playing with various stitching and knitting projects. First off, I’ve taken up Big Green again. It’s tough to do here. I need very strong light, and even with a small task spot in the living room, the only place bright enough is next to a window in the middle of the day. I long for my comfy chair and spotlight at home. It’s hard to spot the progress on this strip because it advances at such a slow rate, but it’s there. So into the stash for some ecru DMC linen floss (which I’ve now learned has been discontinued. 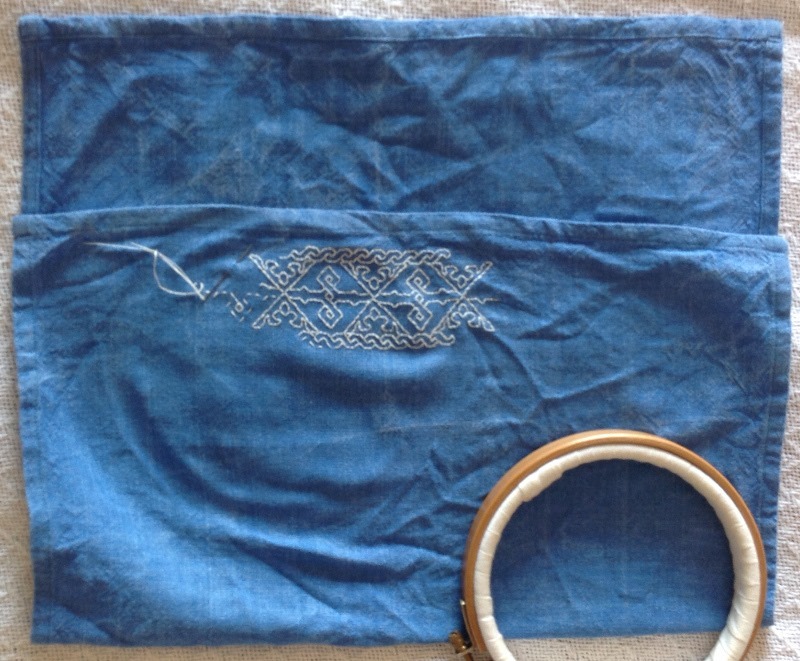 It figures…) Because I’m stitching over 3×3 threads to even out inconsistencies in the weave, and because the linen thread is fuzzy with its own rustic character, I decided to play on that folksy appearance rather than going for crisp, tiny detail. The pattern is yet another one that will be featured in in TNCM2. This, when finished out, will be a strip decorating a pocket edge of a zippered stitching caddy. The entire outside of the case will also be worked in one of the larger all-over patterns in TNCM2. Without cutting up the dishtowel, I intend to origami it into a series of graduated pleats, then stitch perpendicular to the folds to make pockets opening “up” and “down”. The final step will be to fold the entire thing in half, then take an over-long large-tooth jacket zipper (toddler size), and run it around three sides. This should make an organizer pouch that when zippered, lies totally flat. I may sew one of the smaller interior pockets shut, stuffing it with some sort of padding to make pin cushion (perhaps with a finer gauge fabric as liner, so I can put emery into it). And I may also stitch in a couple of pieces of sturdy felt, so it has an integrated needle-book on the inside. The details of this finishing are still idle speculation at this point. Right now, it’s just a quick doodle. I’ve been busy with knitting, too. 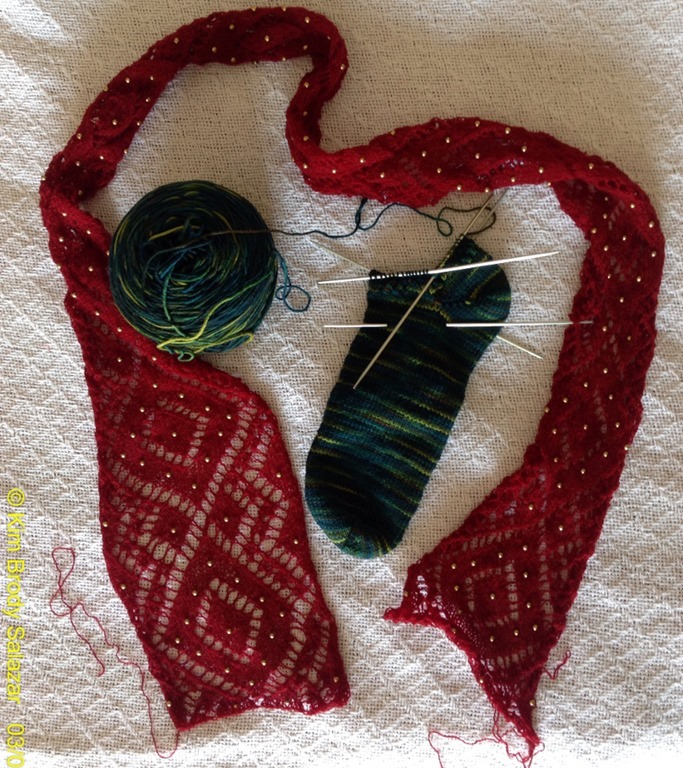 I’ve finished the body of the beaded red lace scarf. 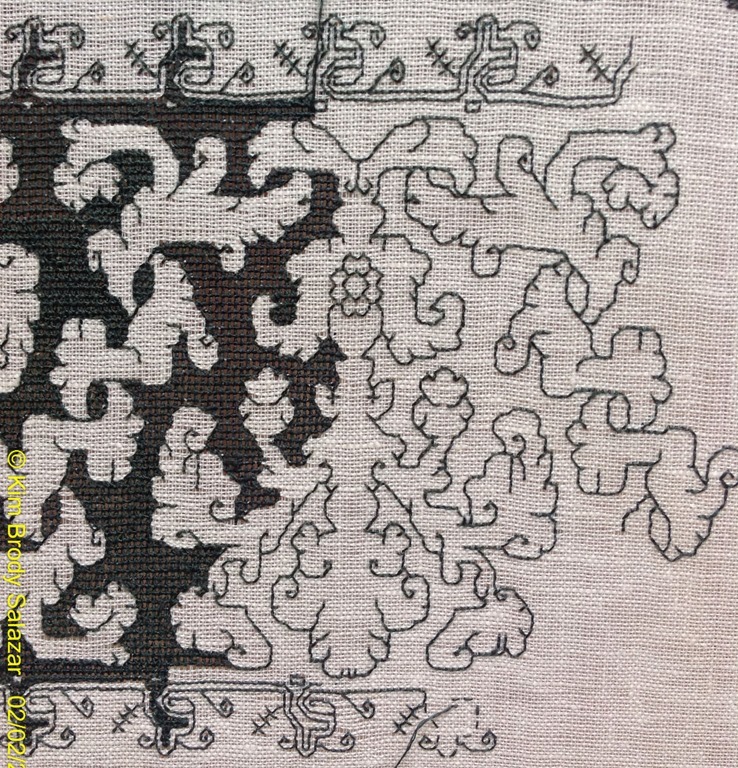 I’m drafting up the companion edging, with more beads and mitered corners. I also have to “kill” the acrylic yarn so that it lies flatter. Not quite sure how I’ll achieve this, since the beads make ironing problematic. 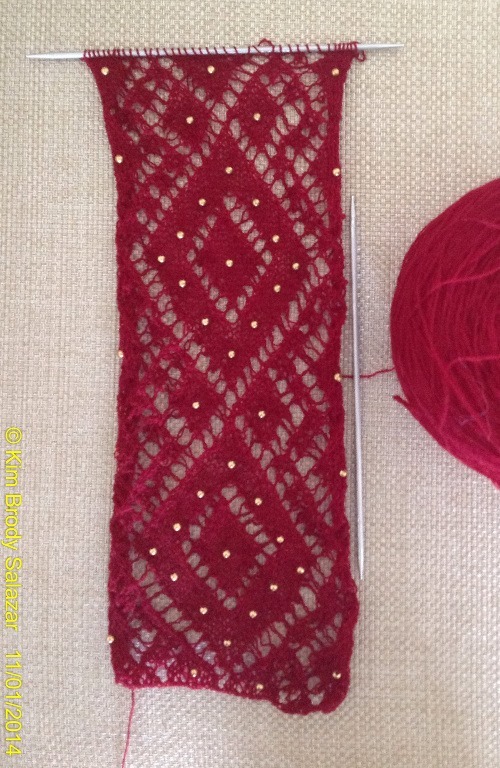 But I’ll figure it out, even if I have to do up a couple of sacrificial beaded test swatches. Also in the photo above is the latest pair of socks. That’s pair #5 in the past two months. I work on them while we wait for the school bus in the morning, or any other time I’m waiting on a line, for a car, or find myself idle outside the apartment. After this pair I’ll have to get creative in combining the leftovers on hand. I’ve gone through most of the sock yarn I brought with me. I have a couple of balls of Noro sock yarn left, but I’d prefer to use that for some other accessory. The yarn is beautiful but I prefer wearing (and washing) other sock yarns, for comfort and durability reasons.